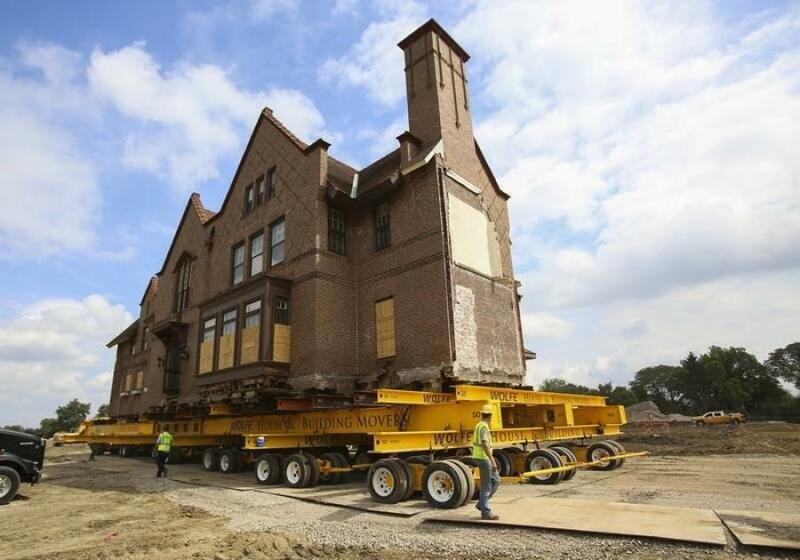 WHEATON, Ill. (AP) Moving a 120-year-old historic mansion in one piece can be a precarious job. But as the wheels slowly turned under the House of Seven Gables in Wheaton on August 28, the lace curtains hanging inside the windows barely nudged. The spectacle drew a crowd of onlookers awed by the engineering feat and relieved that the 1890s-era mansion, purchased by a Wheaton couple, has been spared from the wrecking ball. Shortly before noon, crews from Wolfe House & Building Movers began the delicate daylong process of transporting the 10,000-sq.-ft. house roughly 300 yds., from the center of the former Loretto Convent campus — its address of more than a century — to the southern edge of the property near Seven Gables Park, where it was safely in place by evening. Lifted onto dollies, the 729-ton building edged at a glacial pace of between 1 and 3 mph down a gravel road built for the move. “There's really not a whole lot of stress on that structure,' said Devin Hirt, a project estimator of the moving company's Midwest office in North Manchester, Indiana. The move was a long-awaited sight for preservationists, who have closely followed the saga to save the mansion over the past six months. One operator used remote controls to drive all 21 hydraulic dollies at one time — “kind of like a millipede,' Hirt said. Between the mansion and the dollies was a framework of steel beams in varying sizes that duplicated a house foundation and stabilized the structure. In advance of the move, crews excavated the ground around the mansion and removed some of the old foundation to make way for the steel framework. A jacking system in cribbing lifted the steel beams beneath the house in a synchronized motion — “just like you're jacking a car up to change the wheels,' Hirt said. Now that it's in place, a new foundation will be built, and the House of Seven Gables will become the dream family home for the Wheaton couple who stepped up in the eleventh hour to save the structure from demolition. Long admirers of the mansion's architect, Bob and Katy Goldsborough plan to restore the Tudor Revival house to its former splendor. Preservationists with the nonprofit Landmarks Illinois have praised the couple for saving the work of architect Jarvis Hunt and maintaining a link to an early chapter in Wheaton's past. Inside the mansion are ornate wood carvings and painted beams, attesting to the home's roots in an era of luxury. Built in 1897, the House of Seven Gables joined the so-called “Colony,' an exclusive neighborhood for members of the Chicago Golf Club, the first 18-hole course in the country. Hunt also designed its clubhouse. The fate of the house was left in limbo for months as Pulte Homes prepared to buy the Loretto Convent from Catholic sisters and redevelop the grounds into a new subdivision at 1600 Somerset Lane. Developers offered to donate the home to anyone willing to relocate it. At one point, the Goldsboroughs envisioned the mansion as a public venue and made an offer to the park district to front the moving costs as part of a plan to reopen the house as a wedding and banquet facility at nearby Seven Gables Park. But park commissioners decided in late May not to pursue the project after raising financial and accessibility concerns. Earlier this month, the city council granted the couple's request for a special permit to move the house to two subdivision lots the Goldsboroughs have purchased from Pulte Homes. “Over the past six months, we've worked together diligently to get over many hurdles along the way and make sure this mansion could be saved and moved,' said Rob Getz, the company's director of land acquisitions.